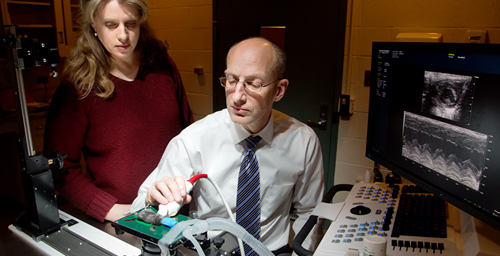 University of Illinois comparative biosciences professor Suzanne Berry-Miller, veterinary clinical medicine professor Robert O'Brien and their colleagues developed a method that enhanced cardiac function in a mouse model of Duchenne muscular dystrophy. CHAMPAIGN, lll. - Researchers have shown that transplanting stem cells derived from normal mouse blood vessels into the hearts of mice that model the pathology associated with Duchenne muscular dystrophy (DMD) prevents the decrease in heart function associated with DMD. 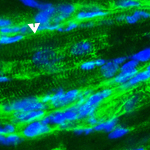 Treatment with stem cells derived from blood vessels spurred nestin-positive stem cells already present in the heart to form new cardiac muscle cells (see arrows). The U.S. Centers for Disease Control and Prevention estimates that DMD affects one in every 3,500 males. The disease is more prevalent in males because the dystrophin mutation occurs on the X chromosome; males have one X and one Y chromosome, so a male with this mutation will have DMD, while females have two X chromosomes and must have the mutation on both of them to have the disease. Females with the mutation in one X chromosome sometimes develop muscle weakness and heart problems as well, and may pass the mutation on to their children. Although medical advances have extended the lifespans of DMD patients from their teens or 20s into their early 30s, disease-related damage to the heart and diaphragm still limits their lifespan. "Almost 100 percent of patients develop dilated cardiomyopathy," in which a weakened heart with enlarged chambers prevents blood from being properly pumped throughout the body, said University of Illinois comparative biosciences professor Suzanne Berry-Miller, who led the study. "Right now, doctors are treating the symptoms of this heart problem by giving patients drugs to try to prolong heart function, but that can't replace the lost or damaged cells," she said. In the new study, the researchers injected stem cells known as aorta-derived mesoangioblasts (ADM) into the hearts of dystrophin-deficient mice that serve as a model for human DMD. The ADM stem cells have a working copy of the dystrophin gene. 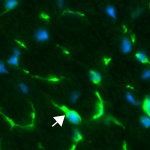 This stem cell therapy prevented or delayed heart problems in mice that did not already show signs of the functional or structural defects typical of Duchenne muscular dystrophy, the researchers report. "These vessel-derived cells might be good candidates for therapy, but the more important thing is the results give us new potential therapeutic targets to study, which may be activated directly without the use of cells that are injected into the patient, such as the ADM in the current study," Berry-Miller said. "Activating stem cells that are already present in the body to repair tissue would avoid the potential requirement to find a match between donors and recipients and potential rejection of the stem cells by the patients." "This is the only study so far where a functional benefit has been observed from stem cells in the dystrophin-deficient heart, or where endogenous stem cells in the heart have been observed to produce new muscle cells that replace those lost in DMD, so I think it opens up a new area to focus on in pre-clinical studies for DMD," Berry-Miller said.